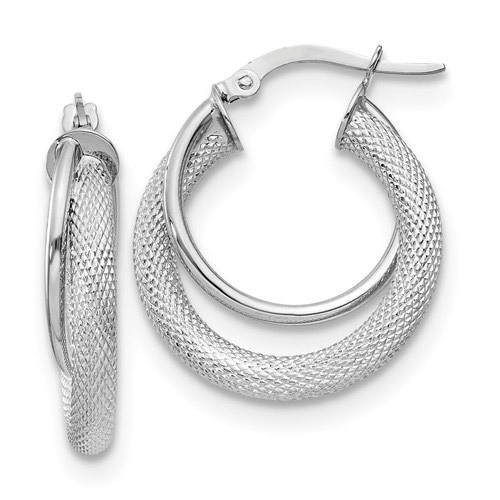 The interesting design of the textured and polished hoop earrings in 14K white gold from Apples of Gold Jewelry are sure to be an instant hit, especially if you are looking for something a little different! The beautiful texture of the outer hoop of the earring is different than the highly polished inside loop, which attaches to the wire and clutch closures on each earring. The loops appear to overlap each other in the Italian-made earrings, which are 1" tall with closures and 0.84 inch round each. The earrings have a thickness of 4.3mm apiece. We guarantee our Textured and Polished Hoop Earrings in 14K White Gold to be high quality, authentic jewelry, as described above.